God will guide only meek people. He will not give His guidance to bad-tempered or hot-tempered people. That is why God took away His guidance from Moses after he lost his temper. All along when he remained meek, the Lord never failed to give him His counsel; but when he lost his meek spirit, God said, “You are not going to Canaan and you are not going to lead the people of Canaan either.” “Thou shalt guide me with Thy counsel and afterward receive me to glory,” the Psalmist says with assurance (Psa 73:24). If we walk in meekness, meekly enduring all the reproaches, rejections and persecutions we face, the Lord will keep giving us His counsel till we reach His presence. We’ll never stumble or lose our way. Some children of God get angry and say, “It’s only righteous anger, godly anger.” Well, God cannot teach you anything. “Take My yoke upon you and learn of Me; for I am meek and lowly in heart,” He says. The Lord can teach only the meek. 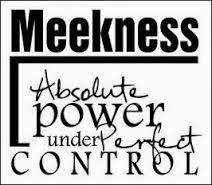 David always got the counsel of God because he always maintained a humble and meek disposition. “My sheep hear My voice … and they follow Me,” said Jesus (Jn 10:27). If we’re not following the Lord just like sheep meekly follow their shepherd, we cannot expect the Lord to guide us with His counsel.